The official full movie trailer of the 3-in-1 adventure movie, "My Big Bossing" was recently released by OctoArts Films in their youtube account. "My Big Bossing" features three episodes of fun and adventure starring Ryzza Mae Dizon and Vic Sotto. Also stars in one of the episodes are Nikki Gil, Nino Muhlach, Alonzo Muhlach, Jose Manalo, and Marian Rivera. From the producers that brought you "My Little Bossings," OctoArts Films, MZet Films, and APT Entertainment, come another movie with big 3-in-1 adventures. Ryzza Mae Dizon and Vic Sotto star in a three-episode motion picture with titles "Sirena," "TakTak," and "Prinsesa." 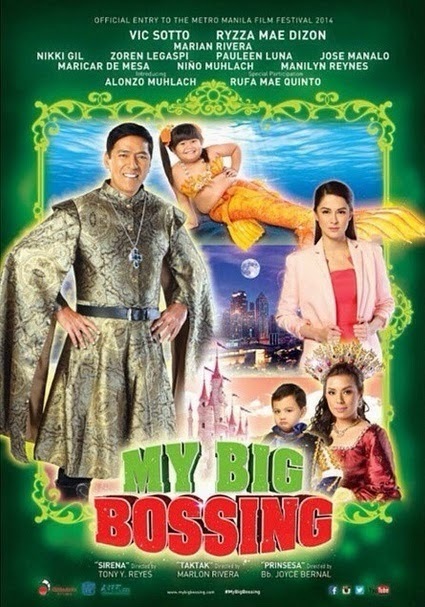 "My Big Bossing" can be considered as an independent movie and not a sequel to last year's hit, due to some reasons, of which the exclusion of James "Bimby" Aquino-Yap in this film. Another reason might be the genre of this film, which is far more different than last year's entry of the same producers. Based on the feedback from last year's movie entry, fans of Ryzza Mae Dizon and Vic Sotto were disappointed with the movie due to excessive product placements inside/within the movie. I do hope this will not be the case in "My Big Bossing" MMFF 2014 entry. Watch the "My Big Bossing" full movie trailer below. Enjoy!